Love them or hate them, standardized tests are an integral part of the US school system. OK, maybe no one loves standardized tests. They can cause stress to your child or teen’s life. They tend to be boring and difficult. It isn’t always easy to understand what schools do with the data they get from these tests. Standardized test scores can affect your child's placement, the amount of funding the school receives, teacher evaluations and more. Your child or teen will take several standardized tests throughout their educational years. Your children will also go on to take other standardized type tests that will influence their futures. They will take tests to get their driver’s permit or license, the PSAT, SAT or ACT for college, They may go on to take a test like the GRE, GMAT, or LSAT for graduate level work. Trade schools, unions, and the military also require applicants to take standardized tests. With tests being such an integral part of education and careers, your child can benefit from learning how to succeed on standardized tests. The following tips are written specifically for a k-12 grade student preparing for a standardized test given at their school to test grade level skills and knowledge. Examples of these tests include Smarter-Balanced Assessment, PARCC, KSA or AMP. Feel free to adapt these tips to other testing situations. The main reason end of the year standardized tests are given is to measure how well students have learned the skills that are expected to be taught at a particular grade level. If your child has been doing well in school throughout the school year, they should have the knowledge needed to do well on the test. You can help your child by providing support for consistent work over the course of the school year. Contact your teacher if you believe your child is struggling with a particular skill or concept. Schools across the nation have been upgrading to new, rigorous standards. These standards are designed to build on the previous years’ knowledge. When you were growing up, chances are if you missed a concept, it would be repeated the following school year. Today's kids may not get that chance in the classroom. Find out your child's scores from last year. If your child has some low scores, find out what you can do to help your child get any skills they may have missed the year before. Reviewing the scores with your child's teacher will help you to decide if your child needs help in a full subject, or just missed a few concepts. There are several different strategies that work in almost every test situation. Your child can learn these strategies, and use them throughout their life. Read a test question completely. Underline the question stem, the part that specifically asks the tester to do something. For essay questions, carefully read the question and be sure that any response made addresses the question. Preparing a brief outline before writing can help. Your child will find different general strategies that work best for different age and grade levels. Yoru child's school teacher will probably include some test taking strategy in the school assignments they give your child. You can reinforce these skills when your child is working on homework at home. You may also find opportunities to reinforce these skills if you play trivia type games or watch trivia game shows together. Children with disabilities and significant learning differences often require testing accommodations. Ideally, these accommodations will be discussed when the 504 or IEP is drafted. Read over your child's plan to make sure you understand what accommodations your child is allowed. Find out how the school plans to make those accommodations. If your child does not have any accommodations for testing, and you believe that they should contact the plan leader ahead of testing to discuss adding testing accommodations. Your child should be familiar with the way in which the exam will be given before the test day. Find out - Will it be a paper and pencil exam or a computer exam? Will there be multiple choice questions, essay questions, short answer, long answer, or some combination? What subjects will be tested on which day? In addition to knowing which types of questions will be on the test, your child should know how to review and change answers before they submit their test. Your child should also know if they will have to wait to start various sections, or if they can work straight through their exam. They should also know if there is a time limit, and what to do if they need extra time that is allowed. 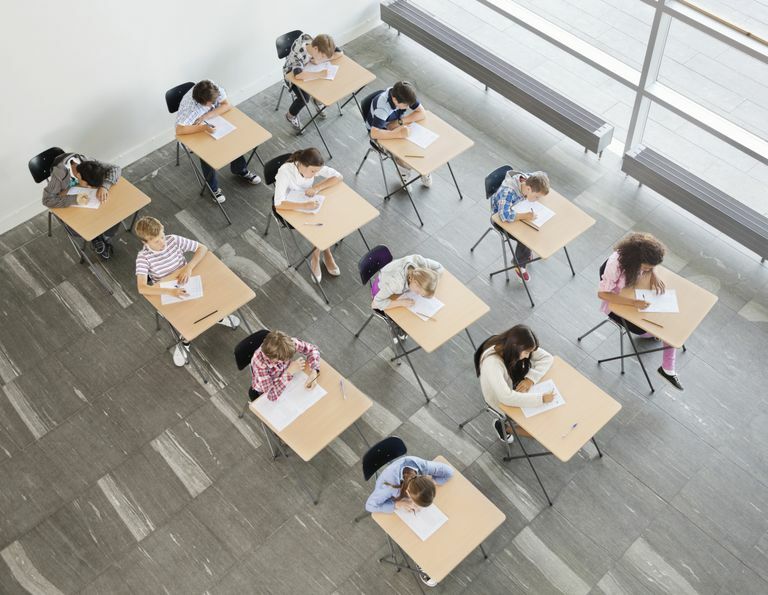 Standardized testing has become a controversial topic for parents and educators alike. Parents have concerns ranging from a fear of emphasizing tests over knowledge to that limitation of any test to measure intelligence. Schools do review their test score data. Even though test scores may not arrive until after the school year ends, a low score may follow your child to the next grade. Be sure that your child does understand that standardized tests are used to measure how well students learned grade level material. You can then use your best judgment about your child's development about how and when to express any concerns you have about the role of testing in schools. If you are particularly concerned about your child feeling pressured on these tests, you may want to tell them that the test measures what skills they have learned, not their self-worth, their kindness, their value as a friend to others, or anything else. Ideally, your child will spend some time at school taking practice tests in conditions very similar to the actual test. If you feel your child will need more practice than what is available at school, you can do practice tests at home. Some states offer practice tests that families can use at home. You can search your state's department of education website, or ask your child's teacher if they are aware of any at-home practice resources.self. Some states offer practice tests that families can use at home. You can search your state's department of education website, or ask your child's teacher if they are aware of any at-home practice resources. Testing is strenuous for school children and teens. Just as you might plan a special treat for yourself after an especially challenging work week, your child or teen will enjoy looking forward to a special activity post-test. Perhaps a special dinner at home or out, a visit to a local park with friends, getting to watch a special movie, or a fun board game night (no trivia or math-related games this time!) would be an enjoyable activity your child will have to look forward to after the test. If your child becomes anxious during tests, it is important to begin teaching strategies early on. Make sure your child arrives a little bit early on test day, so they have time to get to their seat and feel comfortable. You can teach them deep breathing techniques to learn how to relax fast. You can also tell them that if they become anxious during the test, to flip their paper over or close their eyes and practice deep breathing until the feeling passes. If your child is anxious, watch your own attitude towards the test. If they see that you are anxious, your child will feel that there must be something to be afraid of. Reassure your child that they have been "studying" for the exam all year long by doing their schoolwork and that you are proud of their hard work. If your child seems to have an unusually high amount of anxiety about the upcoming test, consider talking with the school counselor for suggestions. Examples of unusually high anxiety would be trouble sleeping and nightmares, or excessive talk of being afraid of the exam - and if these continue after you talk with them in a reassuring way about the tests. Different tests allow the use of different materials. If your child is allowed to use scratch paper and pencils, make sure they have at least 2 pre-sharpened pencils and blank scratch paper for the exam. If your child is allowed to use a calculator, make sure they have on available, that it has the correct functions and an extra set of batteries. Standardized test time would be a very inconvenient time break a pencil or have your calculator batteries die. Prepare for Murphy's Law to hit your child, and make sure they have access to extra supplies they may need, including possible failure of the original amount of supplies brought to the test. Your brain is your child's most important tool on test day. If they are tired, they simply won't be performing their best. Information recall and problem-solving both slow down when you haven't had enough sleep. Children and teens know that these tests are important. They may be nervous or anxious about the tests. Your child or teen may even try to convince you that the test isn't a big deal and that they will be fine if they spend the evening visiting with their friends or using electronic media. This may be a way for your child to avoid any anxiety they have about the test. Be sure to let your child know that although the tests are important to measure what they have learned in school, they are not a measure of self-worth. You can also suggest relaxing activities the night before testing. Brain performance is similar to athletic performance. Make sure your kids eat the right foods to last for a day of testing. Higher brain thought uses up carbohydrates, and protein will keep your child feeling full and help to make sure that the carbohydrates are taken up slowly. Complex carbohydrates, like those found in whole grains and oats, are used up slowly and will help your child stay alert longer than a breakfast of simple carbohydrates. Avoid high sugar cereals, sugary donuts, and candy for breakfast. A breakfast high in simple carbohydrates will lead to increased early morning alertness followed by a crash that will likely occur while your child is still testing. plain oatmeal with added almonds, sweetened with a small amount of honey or real maple syrup. Serve turkey or chicken sausage on the side. a breakfast burrito made of a whole wheat tortilla, filled with scrambled eggs, diced peppers, and ham. Even the best breakfast won't keep your child's energy levels perfectly even throughout testing. Some schools will provide snacks to students during testing breaks. Some schools will ask parents to donate snacks to be given out during testing time. Teachers have specific instructions for testing. Teachers must take roll, read instructions, make sure all children are ready for their tests, and start promptly. If your child is late for testing, they may arrive after the instructions are given, and in some cases, they have to move to a different testing location so as not to disrupt the other students who already started their tests. We all know what it feels like to arrive late for an event when everyone else has started. There is that initial sense of confusion or panic, and it is hard to get settled into the activity at hand. Testing is not the time for your child to experience that. While teachers and school staff will do their best to help children who arrive late get started on their tests, that feeling of being thrown off course will still be there.Be sure your child arrives at school on time and is ready to start when the test begins. Finally, time to relax! The test is now over. Be sure to celebrate the hard work by enjoying a special dinner, an activity with friends, or other activity you planned together. Remember the point of these tests - to measure how well your child learned the skills being taught in that particular grade. Watch your mail and school communication for information about your child's test scores. If your child received any low scores, you will have more time to address any possible gaps in learning that may have developed. If your child has grade level or higher scores – then you know that your school, child, and family have been doing is working for your child. Whatever the outcome of the test, make sure you view the test as one indicator of learning. When sharing your child's test scores with your child, try to relate test scores to effective work done by your child. This is one way you can demonstrate a growth mindset and teach it by example. People with a growth mindset believe that knowledge and skill are the results of hard work and learning. This contrasts with a fixed mindset, that somehow some people are just born with intelligence, and people can do little to change how much they know. If your child received high scores, talk to them about how the hard work they have been doing at school is paying off. If your child received low scores, let them know this is an opportunity to find more effective learning strategies. Avoid labeling your child as being inherently smart or not smart. While standardized tests are not fun, they can be useful tools to help keep student learning on track. Should Your Child Skip a Grade?